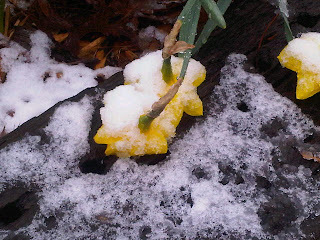 Remember those bright perky daffodils at The Foxtrot in Gatlinburg? Well, they are covered in snow this morning. Big flakes about the size of quarters started falling around 8:15 a.m. Smaller flakes continue through the afternoon. The snow isn’t laying on the roads, which is really good, but all the trees and plants are covered. I was so ready for Spring. Guess I’ll just hibernate with the bears.